Industrial Bearings & Services has endeavored to include an expansive set of products to meet all of your needs. This includes an array of chains and sprockets. To introduce you to the products in question, a sprocket is a mechanism made up of a wheel with teeth intended to mesh with a track, or chain. Their function is to help move rotating motion between varying shafts of which the gears are unfit to operate well on their own. With Industrial Bearings and Services, you should know you’re choosing from an incredible selection of high-quality items. You can even consult with us prior to purchasing the chain/sprocket set for you. Chains and sprockets are commonly necessary parts, used for a number of different mechanisms and apparatuses. Often used to allow a machine to operate quietly, even at incredibly high speeds. Many will confuse the sprocket with a gear, however, it is differentiated in that sprockets are not meshed directly together. They differ from pulleys in their make as well – pulleys being smooth, sprockets having teeth. These are differences that we can explain to you prior to your purchase. It’s also important to know that, should you need some assistance selecting the set for you, we can be that assistance. Different sprocket sizes call for different chain sizes, which call for a variety of size ratios. There are a number of decisions to make when you’re selecting these corresponding pieces – compatibility, material type, and other specifications. We can help guide you to the purchase that will have your machines operating in peak condition. 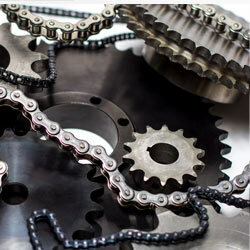 Interested in custom sprockets and chains? Contact us, and we’ll give you all the knowledge and information we have as a result of our 200 years of combined experience. That is our pledge to you. And our customers continue to visit us because it’s a pledge we have consistently upheld. They trust that we’ll continue to do so. An aid to the citizens of Houston and Southeast Texas, our leadership team has expansive knowledge and understanding of the field. And all that knowledge and understanding is, as ever, at your service. Ready to start the selection process for which chain and sprocket pairings are best for you? Great. Give us a call, visit us at our Huston location or click here to email us.